Minitube, the YouTube desktop application has just released version 2.1.6 with a fix for the playback of some YouTube videos. A minor change in Minitube’s Browse tab removes some so-called standard feeds like Most Shared, etc. This simple tutorial will show you how to install or upgrade to the latest build of Minitube in Ubuntu 14.04, Ubuntu 13.10, Ubuntu 12.10, Ubuntu 12.04, Linux Mint and their derivatives via the PPA repository. Minitube is a lightweight and stylish YouTube application. 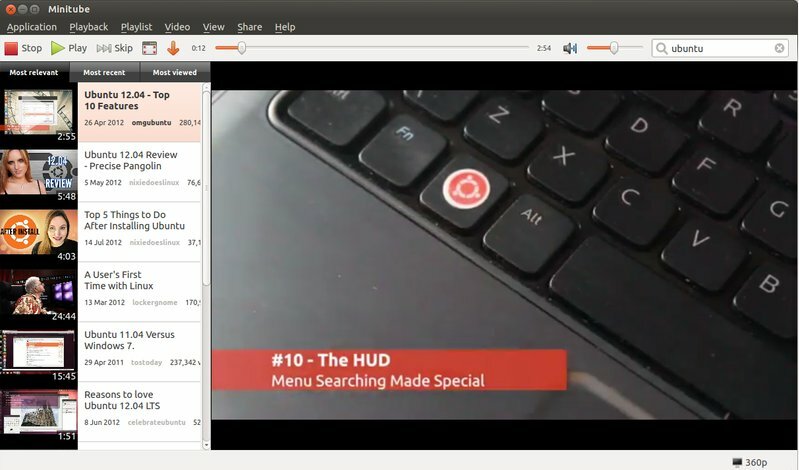 With it you can watch YouTube videos in a new way: you type a keyword, Minitube gives you an endless video stream. Minitube is designed to be very easy to use. This simplicity is great for kids and grandparents. Consider getting Minitube as a gift for the whole family. Minitube consumes less CPU, preserves battery life and keeps your laptop cool. That’s because Minitube does not use the Flash Player. Minitube plays HD videos up to 1080p. Go full-screen and watch them play smoothly. With Minitube you can search by keyword, search YouTube channels or just paste a YouTube link. Related videos are always a click away. You can also browse top videos for your favorite category and country. You can subscribe to YouTube channels and be notified of new videos. Minitube is translated in more than 30 languages including German, French, Italian, Russian, Danish, Spanish, Portuguese, Arabic, Hebrew and Chinese. This will install the latest build of minitube from the webupd8 team PPA.